The day before Thanksgiving at 11 a.m. the call came to cover the Shoshone Grandmother’s Day of Resistance on Mt. Tenabo at the Cortez mine site. 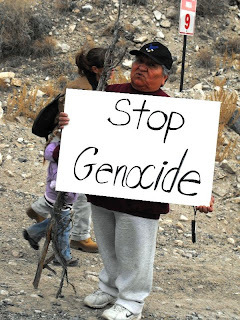 To reach the place where the Western Shoshone Grandmothers were protesting Barrick Cortez’s uprooting of trees and “devastation and destruction” on Mt. Tenabo, as they termed it, required driving some ten miles out from Crescent Valley and a trip up the winding dirt Grass Valley road past the entrance to the mine at the base of the mountain and straight up the curving mountain road for miles. Dave Mason of Barrick Cortez directed the press to look for a parked group of cars and trucks. A natural wood wickiup on the hillside beyond the parking area amongst the juniper and pine was empty. Fresh footprints were seen on a trail leading up the mountain. Following that trail for some 10 minutes, the Western Shoshone protestors were encountered. The Grandmothers accompanied by Shoshone men and children held signs and spoke to the Barrick representative present, George Fennemore. Fennemore told the Grandmothers it was a normal day for him and that his work was in getting permits from the BLM. As the Shoshone grandmothers witnessed the devastation on the Sacred mountain, a rain began to fall. “The tears of the Mother,” said one Grandmother as the others nodded. Attorney Roger Flynn of the Western Mining Action Project reported on Sunday November 30, 2008 that on Monday, December 1st there is “just a hearing for a request for a temporary restraining order, an emergency order to stop things.” Flynn explained the “judge can do what he wants” and can issue an order for “a couple of weeks” while legal briefs are being prepared for a motion on a preliminary injunction.” Flynn said, “If we got the preliminary injunction granted that would stop things for a much longer period. The mine would be enjoined and stopped while the court ruled on the merits and that could take months or years.” Flynn will participate in the hearing by phone although he expects the company attorney from Reno to be there as well as the lead attorney from the Justice Department. Flynn characterized the hearing Monday as an emergency meeting. The plaintiff groups are - the South Fork Band Council of Western Shoshone of Nevada, the Timbisha Shoshone Tribe, the Western Shoshone Defense Project, Great Basin Mine Watch and the nonprofit Western Mining Action Project, which provides free legal services for citizen groups and Native American tribes on hard rock mining issues in the Western U.S. and Alaska. They are asking that the mining permit be revoked.